It was late November of last year (2009) when I first saw the trailer for this movie. It was to be released by January 2010. Excited and patiently I waited to see this movie. 2010 arrives and I thought many would fall in line to see this, and for sure, I have to be one of them. Yesterday, I was so excited to see the movie. I thought it was going to be big just like Avatar was and 2012. Those movies definitely swept everyone's expectations and filled us all with awe and unchartered appreciation for all the effort put into creating them and putting them out for public's consumption. Let me tell you, I did not think that my night would end the way it did after seeing Legion. 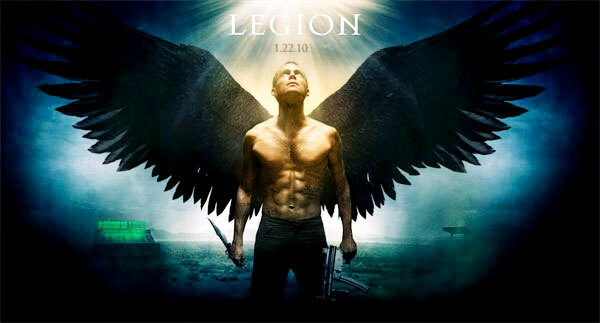 Legion is defined an archaic word used for "army", or a large military unit. The posters display of a beautiful yet ironic image of an angel--well, at least ironic from the common depiction of "angel" in our religious and social knowledge. I think this was what made it more dramatic. The trailer was catchy and really made a good haul of audience. At first, I thought there would be more people than those that I saw at the cinemas during the screening of Avatar and 2012. That made me a bit dubious about its impact, but I thought to myself.. "Hey, what the heck! Its about angels and demons and that kind of stuff. I can't miss it for sure!" It wasn't hard to get tickets at 8pm whereas the next screening was at 8:20pm! That's way impossible to do during Avatar or 2012 screening! The movie was obviously not produced by bigtime producers.. not the famous ones that is. But it started out right. The cinematography was really great. Except that, I could have told the director that this was intended to be released as a movie, not in series of still shots to be wound up for viewing. Its sooooo not 1930s! The first few frames of introduction showed really impressive angular shots at the local diner's area. The whole sunset and empty highway was very beautiful to look at, but when it was all about action and dialog, everything looked like it was just your college movie project. I would have loved the whole tagline thing: "When the last angel falls, the fight for mankind begins." But the whole story doesn't even entice me a bit. God would definitely NOT lose faith in mankind! That's not the kind of fact you'd want people to believe in. Its definitely not the thing that would start out as hard fact in the story. The characters seemed to have been randomly chosen and randomly killed like there was no fashion in it at all. In the end there just had to be the girl, the boy and the baby. I just don't buy that kind of story wherein nothing was explained fairly. Each character abruptly matures into a totally new personality within minutes without a graceful leap. We were just left there to understand and bridge for the missing information. Why would a "loser" guy (Jeep Hanson) suddenly be the source of Michael's faith? Or why would he suddenly become a prophet whose instructions were suddenly marked throughout his body with utterly no purpose at all?? Oh, and did I even mention that the possessed humans looked like they were aliens? I thought they were possessed by angels. Oh my.. While I was at it, trying to understand why I was even watching this movie, I still believed that something good would happen in the end. But lo and behold! I was mistaken. Everything ends with Michael's condescending statement to Gabriel: "This is why you have failed the Father". Hmm.. excuse me, but there was no explanation why Michael suddenly resurrected back to his angelic form and that Gabriel seems to be the one who was being put to the test now. Sigh.. I went in to visit the official site, wanting to find more interesting facts.. and maybe, just maybe change my mind about it being such a bad movie for me (IMHO). I found it very hard to even take a look at the still shots in their photos section. Its like the photos would still have to be chased before I could even view it! Fail. I also tried to check the downloads section and the preview for the wallpapers is very small. I wished it was a bit bigger so I could get a good look before actually downloading the wallpaper. Oh, I could keep going at this. The movie doesn't really deserve this post, except that I could at least mention that the soundtrack is good. I sure do hope the next "Angel" movie would really give the "Angels" the limelight they deserve. Right, Araniel?